Consumers (data subjects) have a right to access what kind of personal data a data controller (a merchant using Nosto) processes in our service. This is also known as personal information access request, which requires a data controller to share what Data Nosto has processed on behalf of you. The personal identifier for Nosto is email address. 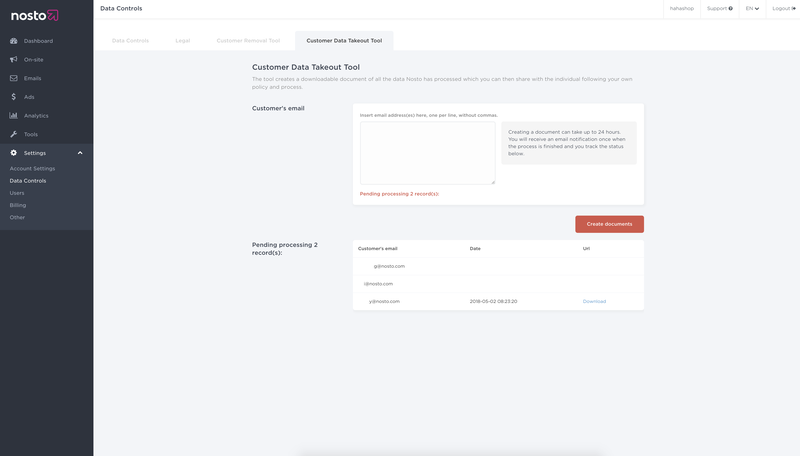 By inserting an email address under Data Takeout Tools to the reserved field, you can generate and later once the process finishes, download a report document from the Nosto admin, and share it according to your company policy with the data subject. The document includes all the details we have processed from the given individual.